A year ago I would definitely say to my self quite often that My Teeth Are Horrible but a year later although they are far from perfect, they are a lot healthier and getting better every day. It was after going to my dentist for a filling that I realised how bad my teeth actually were. It was then that I decided to change my bad oral habits and there has been a lot of trial and error but I have found things that have helped my teeth and gums stay healthy. Today I am going to share everything I have done in the past year from habit changes and trying different products that helped reverse the years of neglect. If you want you can browse this website because I have written tons of posts on various subjects that will help you. Why Did It Get So Bad In The First Place? As a child I was not really taught about the importance of brushing, my parents were pretty relaxed about it all. No one gave a crap about it. The dentist was non existent in my childhood. He only came into my life when I needed a filling in 2 of my bottom molars, this was around age 12 if I can remember correctly. I remember the dentist giving me a look of disappointment when he saw the plague that was in my mouth. There was so much plaque build up, tarter formation and 2 of my upper teeth were misaligned (not my fault). He told me to start brushing twice per day and use mouthwash which although is pretty basic stuff, to me this was unknown territory. From then on I started brushing every day. It wasn’t quite twice per day but it was a step in the right direction. From the age of 12 up to the age of 22 I was doing the basics of brushing my teeth and using mouthwash when I could be bothered but it wasn’t enough and I knew this but for some reason it didn’t bother me too much. I was more concerned with my education. 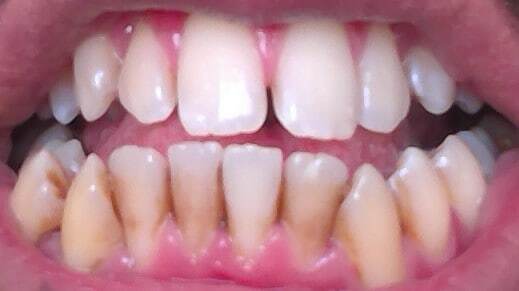 My teeth were covered in plaque and now I started noticing dark brown stains on my bottom teeth. These looked unsightly and I started becoming more self-aware and conscious that something needs to change. Unfortunately it didn’t, I was still stuck in a rut and could not change my bad habits that plagued me for 10 years. Remember earlier when I said I went to get fillings carried out on my bottom molars when I was younger. The filling on my left molar came out. You would think that a normal person would book an appointment and get it sorted as soon as possible but no, not me. I decided to carry on with a big hole in my tooth, which surprisingly did not hurt or cause any discomfort. This is why I didn’t go back, oh and the other reason being that I somehow got this phobia of the dentist. It was partly due to the pain I felt when I first got the fillings done. The pain of that was etched into the back of my brain. It was only when food particles started getting lodged in there that the tooth started hurting and it got so unbearable I had to give in and face my fear. When I got there, he was looking at the affected tooth and I could hear him muttering: Oh Jeez. I could understand because the tooth was like that for 2 years and the hole had got bigger. After the mini operation he advised that I get an electric toothbrush and use Corsodyl mouthwash to help with bleeding gums. It finally happened, after buying an electric toothbrush there was a shift in my behaviour and thinking with regard to oral health. I realised that a few more years of neglect would cause periodontal disease so I had to stop it while I only had gingivitis. Flossing was something new to me but once I realised why my teeth had plaque in between them, it made total sense. 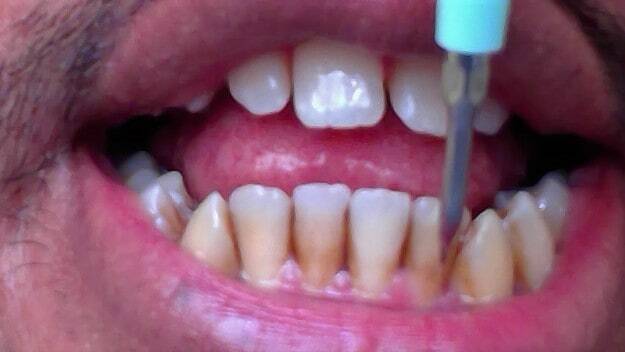 I wasn’t doing anything to clean the spaces in between my teeth which lead to overgrowth of bacteria and plaque. I went ahead and brought some dental floss sticks and started using it. The difference I felt was insane. The cleanliness of using floss and brushing was amazing and the first thing I noticed was tiny little debris being pulled out from these small spaces. It felt cool to see all this gunk being removed but disgusting at the same time if you know what I mean! The electric toothbrush made a big difference because it had some great features to help me maximise my cleaning routine. The first one was the timer which blew me away. With my manual toothbrush I didn’t know when the 2 minutes was up, some days I would rush and neglect some areas of my mouth while other days I took much longer than 2 minutes to clean my teeth. Both are bad because over brushing can lead to gum recession and enamel wear but with my new electric brush, I knew when to change to different areas of the mouth and it vibrated when the 2 minutes were up. Another feature I liked was the Pressure sensor, This helps to make sure you are not putting too much weight on each tooth. High pressure can cause gum irritation and recession and makes you bleed more. 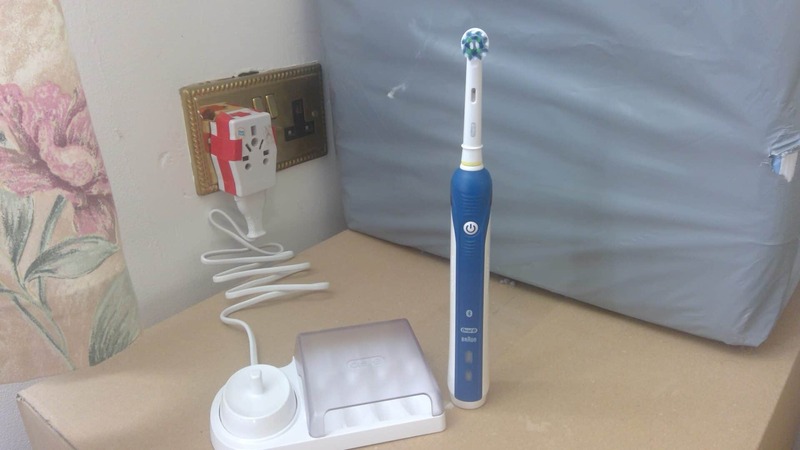 The Oral B 5000 is what I went for in the end and so far it has not let me down. It has loads of great features in addition to the Pressure and timer sensor. I created a full in depth review of this brush for anyone who is looking make a change. You can read it here: 100% Accurate Oral B 5000 Series Toothbrush Review: My Personal Experience. Once I incorporated proper brushing and flossing into my routine, I wanted more!. I was hungry to learn everything about teeth and gum health and that is how this website was created. Everything I learned from various sources, I decided to put into one place to help other people who were suffering from similar problems. Teeth are coated with calcium and phosphate ions and saliva is the main carrier of these minerals. It’s important to have optimum levels of saliva in the mouth to keep this process running. However, It’s very hard because tooth demineralization occurs at the same time. Why? When we eat something, it produces acid and this causes bacteria to release bad compounds and creates plaque on teeth. This stops saliva from penetrating and transporting these vital minerals to the teeth. I have a couple of teeth which are showing signs of demineralization and the way to tell is if you can see the enamel wearing away and the colour of teeth becoming translucent. So I researched this topic to see if there was anything to help revere this and after a couple of days I found this Remineralizing Tooth Powder which showed some good promise. I was desperate to try anything that would help to fix my teeth so I went ahead and purchased the powder. Long story short, it was amazing and in the first week I noticed the sensitivity I had on my bottom middle tooth was gone. It also helped to strengthen my enamel which is why I purchased it in the first place. And like I said before, I documented my experience by writing a full review of the product. Here is the article if you want to see how it works: Picture Proof To Show You Can Remineralize Teeth Naturally. This might be the most important thing for me. I have always had bleeding gums and it was a major concern for me. It is one of the major signs of gum disease and if I didn’t do anything to fix it, it would have developed into periodontal disease but thankfully I realised the danger and acted quickly. Before I continue, I like to mention that I prefer going for the natural treatment options because I have read they can do wonders for our health and have no side effects unlike chemically produced treatments. After looking around for gum disease cures, I came across natural oil toothpastes which was quite interesting. Apparently the essential oils contained within these oil pastes have been scientifically researched and have antibacterial and ant inflammatory properties. Two Main players when it comes to controlling gum disease. I was convinced and went ahead and brought the Healthy Mouth blend from a company called Orawellness. Again, the changes I saw were amazing. My gums felt a lot better and they were starting to turn a nice pink colour. I saw that the top gums became more plump. 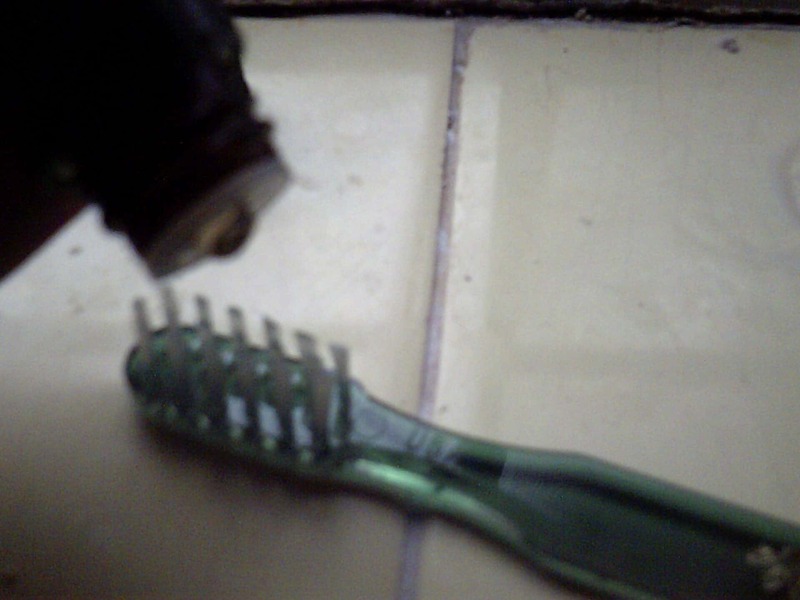 But it wasn’t the oil toothpaste on its own that did this, I had to combine it with a new brushing technique. I had never heard of it before but the guys over at Orawellness recommended combining the two together. The Bass Method Of Toothbrushing is a technique used to disrupt the pathogenic bacteria below the gum lines where normal brushes cannot effectively reach. A bass toothbrush has fewer bristles than your average brush which helps it reach those awkward crevices in and around the teeth including the gum line. Micro vibrations is the technique used to help disrupt these bacteria. It really does make a difference and if you want to see all this in action please read this post on the Orawellness Starter Kit Picture Review: Will It Work. You will see a picture of my teeth and what happened once I incorporated the whole healthy mouth blend system. MAGIC HAPPENED! What About Removing Those Brown Teeth Stains? Don’t worry I got you covered. For this I heard a lot of people saying that baking soda helps to remove stains but for me this did not work, my stains were dark and firmly attached to the teeth. I considered going to the dentist to get some cleaning done but that would be expensive. Instead I Searched for dental calculus removers online which showed me some manual scaling and pick tools that dentists use themselves. I was going to purchase a set when I came across an Electrical Calculus remover called the Uniharpa. It promised to remove tough brown stains on teeth and for some reason I believed them. Even though they only had 2 reviews for the product, my gut instinct told me to go for it. I did and a week later I was shocked and Amazed at the results I achieved. It absolutely worked and it only took about 30 minutes to get rid of the brown stains on my teeth. 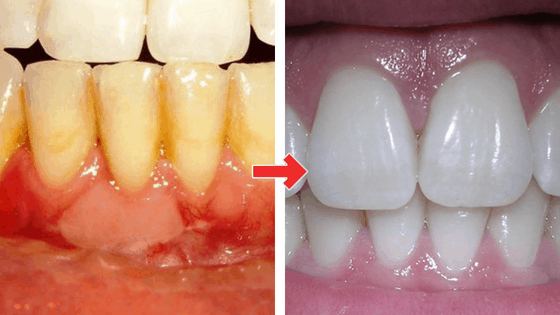 If you want proof of it working please head on over to this post where you can see my Before and After pictures: How To Remove Brown Stains On Teeth Comfortably At Home. Trust me when I tell you, You can achieve great results without going to the dentist. A bit of research goes a long way but fortunately I have already done that for you :). Now its your turn, are you ready to finally take your oral health seriously and achieve the happiness you desire and deserve? There you have it folks, I have let you into my personal life to show you my experience with my teeth and the problems I had as a child and the struggles I have overcome to finally get to a place where I am comfortable with my teeth and don’t regard them as Horrible! Obviously its not easy, first comes the mindset change and then you have to do a lot of research to find out about your individual problems. 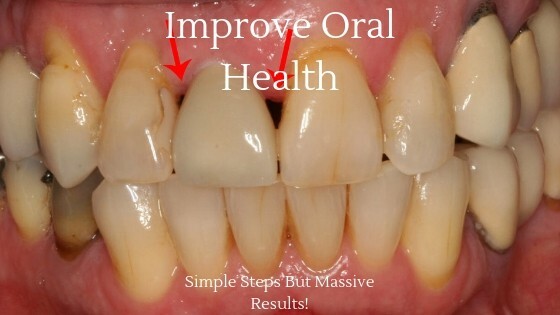 From there you can take small steps to change your oral health. I did it and so can you. Read through the whole article and look at the methods and products I used to help fix my horrible teeth. If you sincerely follow the advice on here, your teeth will be in a much better place than they are now! For me personally, I am going to get my teeth whitened using a home whitening kit because I have yellow teeth and then a few months later I will be looking to straighten them using braces or invisalign. I you have any questions about other problems you may have with your teeth please leave a comment below and let us help you. Thank you for sharing this information. I’ve been considering whether or not to invest in an electric toothbrush (my teeth aren’t the greatest and the timer feature sounded good). I didn’t know about tooth remineralizing, do they mention it on commercials? If they have I’ve never paid close enough attention. Anyway, thank you for the information and I appreciate you sharing YOUR results as opposed to just talking about the benefits. As far as im aware, there has been no mention of teeth remineralization on any commercials. I don’t think people know much about it. Thanks for the thorough write up of how to effectively care for your teeth and restore them to health. I’ve always had issues with my teeth as my mouth was overcrowded which left places I couldn’t reach with a toothbrush and flossing was down right painful with it’s whipping action on my gums! I’ve always been skeptical of electric toothbrushes thinking they were just a new way to make money. I’ll definitely give it a try now. Have you ever tried using a water pick? Was it effective? Electric toothbrushes are not a gimmick. They have been proven to be far more effective at removing plaque than normal manual brushes which is why my dentist recommended it to me in the first place. I’m glad you started to see some success with your teeth and hygiene started to improve too, well done for that. All my life I have brushed 2 times a day, for 2 minutes, usually with an electric toothbrush, and my teeth are pretty good. Only thing is, is that when I brush my gums bleed and this is because of inflamed gums, according to my dentist. So he told me I need to make it bleed even more, which hurts, but apparently this will help and eventually will stop the bleeding in the long run. Seems counterproductive but apparently if I stick with it, it will help! Wow i have never heard anyone mention that making gums bleed on purpose is beneficial. I’m really intrigued now and will research this up. I used the Orawellness Healthy Mouth blend which drastically helped reduce the rate at which my gums bled. I actually need to order some more, i’m running really low. An electric toothbrush will not get in between your teeth so it’s important you get a some dental floss or dental picks to do this. Bad breath is associated with dry mouth and eating foods which have a strong smell such as onions or garlic. If you do the basics right i.e brushing, flossing and cleaning your tongue, you will have longer lasting fresh breath. I really dont think in a lot of cases people dont understand how important tooth care really is until its too late. I am guilty of that as well. I still dont have an electric tooth brush but I think that is my next step. I generally brush my teeth in the shower. Is it okay to take electric tooth brushes in the shower or will that hurt it? Most high end electric toothbrushes are now water proof so it should be fine to use in the shower but try not to run it under water for long periods of time just for precautionary reasons. Hey there, great review and great website by the way. I was just like you; I wasn’t taught on properly taking care of my teeth until at a later age. One night, when I was 24, I have eaten a whole box of candy and experience a horrible toothache. It was so bad that I had to go on a dentist visit, and the doctor informed me that I need a root canal. It hurt but I faced my fears, and got it over with. I also needed two crowns and fillings as well. The doctor instructed me to brush my teeth, floss in between, and also use mouthwash twice a day. I have carried out on his advice, and my teeth were starting to feel better, plus the bleeding from the gums have ceased. Normally, I visit the dentist twice a year for a cleaning, but I need new dental insurance, which I am looking for. Thanks again, and good luck with your website!! I’m glad you are feeling better now and yes, the dentist is your friend not foe. A lot of people tend to fear them and this can lead to more problems later on with your teeth. I always recommend you get advice from a dental professional as well as trying out natural remedies on the side. In my experience this is the best combination to maintain healthy teeth.